GoodEarth, known for constructing environment-friendly and sustainable neighborhoods introduces its latest Community Called Malhar patterns- Garden Courtyard Home. 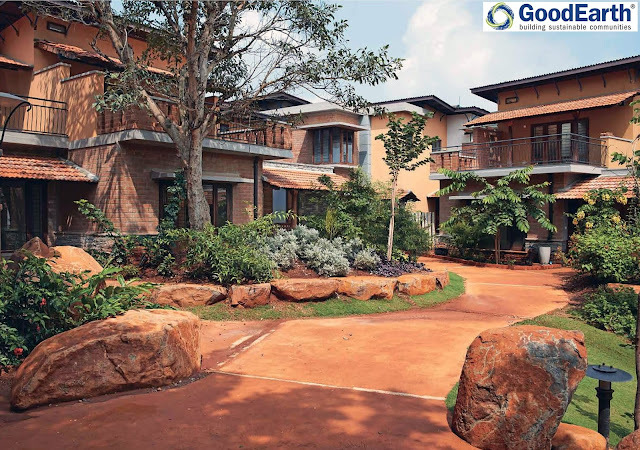 GoodEarth Malhar- Patterns is an eco-village spread over 12acres of land, located in Kengeri, Bangalore. Patterns is truly a distilled essence of GoodEarth ‘s understanding in designing layouts for homes and is based on how people live in them and use them; and how the home can help them interact with their neighborhood. Each of the patterns in GoodEarth Malhar has its unique characteristics. The GoodEarth Malhar- Patterns project is the fifth community of the Malhar Eco-village continues with the aesthetic traditions of the development. The Malhar Pattern -Garden Courtyard Homes are similar to the old traditional houses. Like the aangans of the old traditional houses these homes have walled gardens that are open to the sky but are an extension to the built spaces of the house. The gardens are enveloped on two or three sides by verandahs and windows that overlook them including those of the floor above. Abundant light and ventilation are the strengths of this home. The courtyard becomes a platform for expression of different cultures, from a tulsi adorning its centre to a play space for young children, it has manifested in all forms. Based on the work and philosophy of late Laurie Baker, the award-winning British born Indian architect, Good Earth was started by a group of architects and engineers who abide by his belief in sustainable architecture. The team, comprising of Architects and builders Stanley George, Jeeth and Natasha Iype and Parthasarathy S has been experimenting with alternatives in architecture, exploring concepts of holistic development, through ventures in housing, organic farming, tourism, for the past 18 years. The properties are built-up with Green Technology bringing out the most esthetic designs close to the nature. Our clients have been NGOs, Government departments and the private sector representing tourism, housing, institutional and educational sectors. With breathtaking properties in Bangalore, Calicut, & Cochin, GoodEarth believes in encouraging creativity, learning and growth, and nurturing of a deep appreciation of the gift of life.